Does your business have an online presence? Even if it has you should take a look at this gorgeous theme. 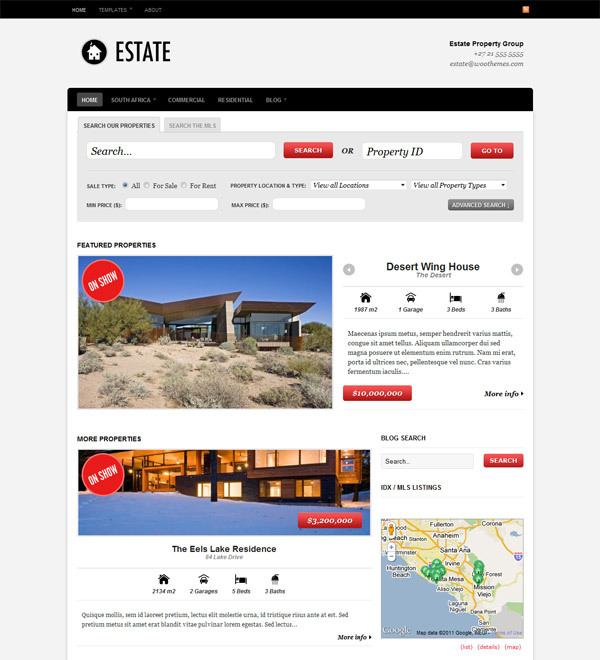 Based on a real estate design this premium theme has every function that a product selling theme needs. Originally made for real estate sites, but if you change the logo the theme can be used for almost everything from selling cars to personal blogging. The theme has a built in custom admin interface that lets you change almost everything in the theme. Enable or disable elements, change or disable content sliders and so on. No HTML knowledge is needed to customize the theme. This theme has six different color styles that can be changed through the custom admin interface. All you need to do is choose a color style and save it. 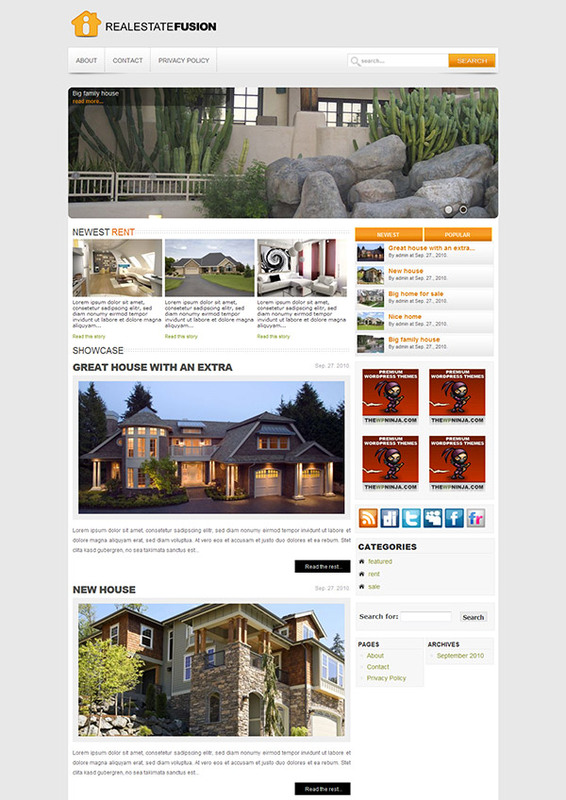 With the Real Estate Fusion Premium WordPress Theme you are getting a modern and unique design, custom admin interface, complete installation and usage guide, built-in scripts, special script free menu, PSD logo source, single 300px wide sidebar widget space, built-in advertising options, content slider (can be disabled) with post listing function and a Google Analytics ready code. 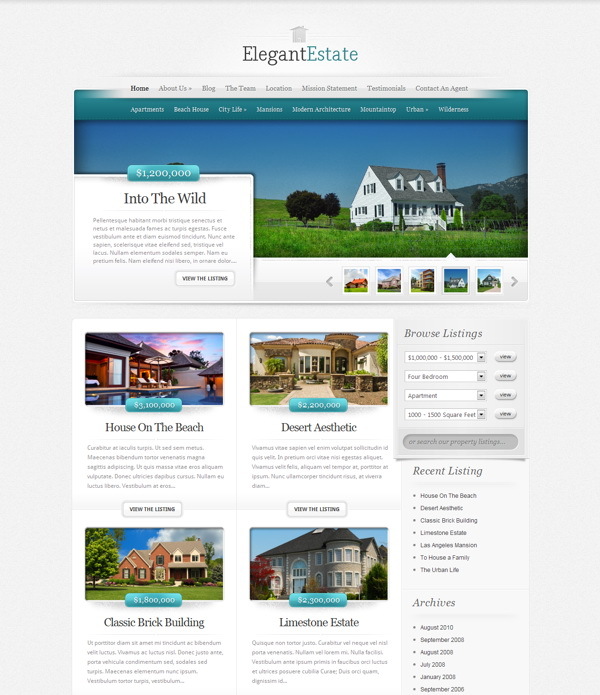 ElegantEstate turns your WordPress blog into a full-feature real estate website. The theme makes browsing your listings easy, and adds special integration features for property info, photos, Google Maps and more. Help increase sales by establishing an elegant and professional online presence today. ElegantEstate comes with four different color variations. If Blue isn’t your style, then try switching to the Red, Green, Black or Purple color schemes. Even though ElegantEstate was created to be a CMS with a Page-Based structure, you can also run the theme like a normal blog instead. This theme utilizes timthumb to automatically resize your thumbnail images. Because of this, only one thumbnail images is required per post, despite the various thumbnail sizes used in the theme. With ElegantEstate you can place 125×125 banner images in your sidebar and 468×60 ads to your post pages with ease. Advertisements are handled from within wp-admin, and can be turned on and off at any time.